I keep forgetting to post our new items here on the blog. Or is it annoying to see jewelry all the time? Would you rather just see the regular posts? Did you know it's hot? Too hot to eat. Too hot to work. Stupid hot. That's my adjective when I've run out of adjectives. It's so hot my brain's not working. Not as well as normal, anyway... and that's not sayin' much. Did you see our newest items? Any old comment will do. Except something mean. I like to delete those as soon as possible. Tweet it (include @TheRustedChain in your tweet), facebook it, and blog it for additional entries. Be sure to leave additional comments for these. Now go have a fruity drink with an umbrella, sit in the wading pool, and pretend you're on a beach somewhere. p.s. discount code HOT15 still works to get 15% off your entire purchase! I like both of them but the soar birdie is ssssooo sweet! Does that count as an entry? beki you made that bird one just for me... i know it! i am in LOVE! Love that sweet little bird ... too, too cute! I love overcast days, the heat doesn't seem so hot. But come Sunday we are suppose to be in the 100's...OUCH! That is way too HOT for me. I just love the bird! Sweet and simple! I put it on FB, but my profile is private. THey're all so pretty! I love your jewelry and your blog! Try to stay cool! i like to see your jewellery, it's like a glimpse into how your creative mind works :) that birdy is especially cute... i think i would stamp "free" or even "freed" on it (except that saying "freed" in my head too many times makes it sort of merge with "breed"... which is, erm, weird.) happy friday! THe SOAR bird is so beautiful and inspiring! How creative you are!! does the "cherish" one have another half? i've been looking for friendship necklaces for both myself and my best friend...it may sound cheesy, but we've been wanting to do it for awhile. It would be a dream come true to receive one of your beautiful creations!!! you've been facebooked by me, too! I saw the link in daughter Sara's facebook. We LOVE your things; I'm especially liking the CHERISH, since we can advertise our family members without being specific. What a great idea! How sweet. I love the soar necklace! The bird is so precious! Love the bird! So cute! Oooh, i love the cherish one!! Bet it's hotter down here - 80 degrees & 90% humidity at 6am and 90+ degrees by 10am. Your earrings I bought last year are still my total faves! I wear them daily. I love the Soar. I would love to get that for my teenage daughter. I ♥ your jewelry and never get tired of seeing it. These necklaces are gorgeous! So talented. Love the fly necklace! So cute! Try to stay cool, it's stinkin' hot here too! Ugh. OMWord - how cute are those!! Would it be wrong to have one of everything you make?! OMG I love the Soar birdie... that guy needs to be "Soaring" around my neck!! I hope my comment comes through. I'd love to have the Mama bird. so he called me MaMa. Since he was the oldest, his younger siblings followed along. me MaMa. It would be perfect. I'm loving your new creations too! I have a friend with a milestone birthday coming up and had some upheaval in her personal life. So if I was the lucky winner of one of your goodies; I'd have to give her the "Soar" necklace. Perfect for this past year!! Yay - those are very HOT! oh my word! i need that soar necklace. like, really, really need it. i love it so much i think my life might depend on it. I really like the bird one! I would love to win, I always LOVE your work Beki!! I think the soar one is precious. I have in mind who I'd give it to, too. 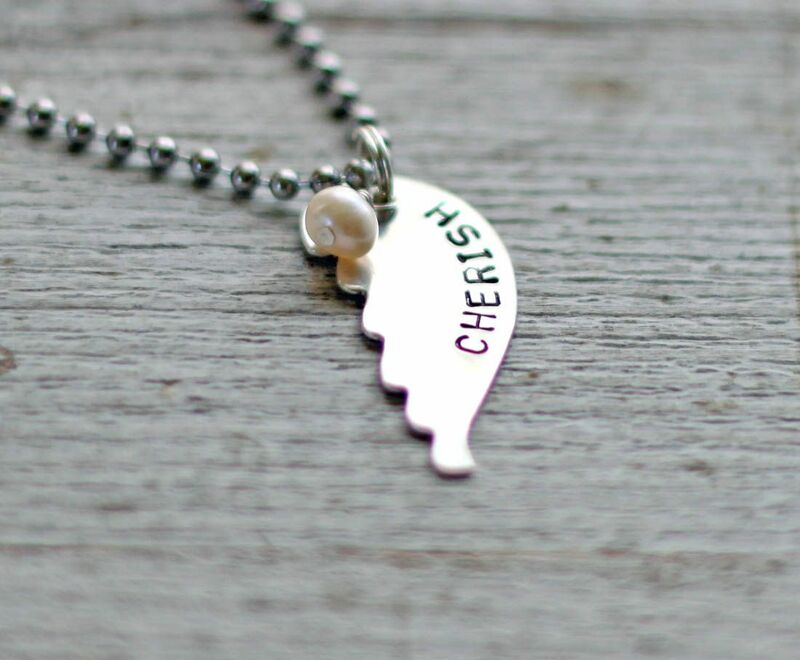 I love the cherish one- made me think of my Mom, I lost her 8 yrs ago and today is her birthday. Thanks for sharing! I really, really, really want to win! But if I do... you'll have to choose for me because I love them both! Love the bird-reminds me of a dove of peace-something we could all use a little bit of in this day and age. I agree it is hot-we can't use our air conditioner this year so we are roasting along with you. It is amazing how much warm air your house traps during the day. Enjoy your little pool-sounds like fun!!!! Thanks for the chance. Have a blessed day. I got a great compliment on my Plant Seeds necklace today - I love it! The Soar necklace is amazing. Love it! I'm pretty sure you'd like to give the bird one to me. Pretty sure. a bit behind in my blog reading guess I picked a great day to catch up!! i love that cherish one! I love your jewelry! That birdie is fantastic! Hope you're finding relief from the heat and having an excellent weekend, Beki! I love both of these, but my favorite is the idea of the birdie with Mama on it! Thanks for the chance to win! I'd like a necklace please (; that 'soar' one is sweet! Found your blog today thanks to Twitter links. Love your jewelry. Love your photos and your Fingerprints of God message touched my heart. Sweet, sweet! I would love the "soar" one. Very cute! i think i just might be getting two of those half hearts for myself and my bestie!! who wouldn't love an old fashioned best friend necklace?!?! and that mama bird necklace would be fantastic for me!!! i love it!!!! how did you know i had been hunting for the perfect necklace. just might have to dig the change out of the couch and buy me one of those cute little birdies. i love unique things. 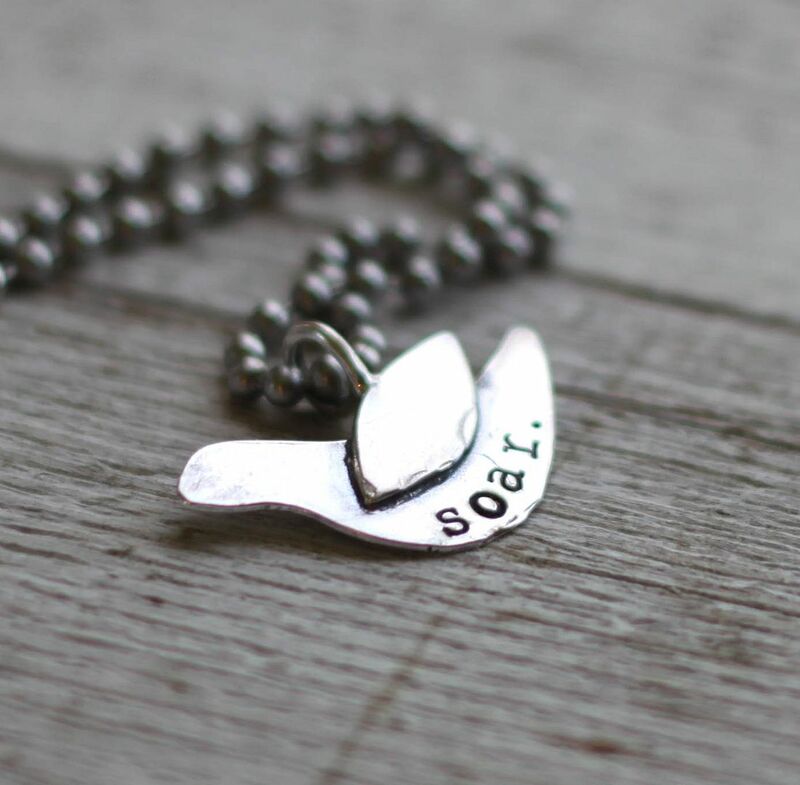 that soar bird is such a simple statement piece - LOVE. ps. just noticed you only need 3 blog followers to hit 1,000 - so i added that to my fb post, that's so exciting!! pps. hope the wedding shoot is going/went well!! I like both of them but the bird is my favorite - who wouldn't like to be reminded to SOAR?! I never get tired of your jewelry posts! And it's hot down here in Sweet Home Alabama too!!! So cute. Thanks for the opportunity to win! They're both so cute! I especially like the bird because I have been obsessed with them lately. It is crazy hot here too. I don't want to leave the AC...ever. My fav. is the bird. Simply sweet! Thanks for such a great giveaway! And, yes, it is hot! Oh my gosh - I'm going to second the "stupid hot" I'm sitting and dripping in sweat! Any who... I love your jewelry, great new pieces. Love the bird - especially your mama suggestion! I agree...stupid hot it is! Dang Kansas weather anyways. Love the bird especially (although I love everything you make!). The little bird just is too sweet to pass up! I love the little bird, she's sweet. I hope I win. I'm embarassed to say that I don't have a clue what "Twitter" is. Am I living in the Dark Ages? And we don't allow Facebook at our place, so I guess only one entry for me. I sat in the wading pool with the kids yesterday -- I think Nebraska must be nearly as hot as Kansas! Yowza! Just posted a link on my facebook wall! I am going to be different and say I love the cherish necklace!Though both are gorgeous! I am sweltering in the heat too! both of them are absolutely adorable! Just beautiful jewelry...I love your jewelry and I LOVE your blog. That was an amazing sunset. Both are precious!!! Would make perfect for a gift for my teenage daughter!! Hope I win!! Just found you through the arthur clan blog and you do fabulous work...love it all and both necklaces for sure. Just found you..love your stuff! Wow...what amazing work. Found you on I Heart Faces. I am in love with that little bird. Beautiful. We are getting a little break from the heat today. That bird is too cute. So cute! I wouldn't say no to one! Comment. I'm leaving it here with you. Please take good care of it. Oh, and I should warn you - don't turn your back on it. It can't be trusted. I absolutely love both of them but the little birdie just tugs at my heartstrings. So precious! love your jewelry...blog...stories... just love it all!